This is a decadent pie. A fudgy chocolate layer topped by a creamy peanut butter layer finished off with a fluffy meringue. I was inspired to make this pie after watching Kelsey’s Essentials and she made a Salted Caramel Banana Cream Pie. She mentioned that if you didn’t care for that combination a chocolate and peanut butter duo would be great. I had originally envisioned the chocolate layer being made with hot fudge sauce but I was afraid that it would be too difficult to eat once it had set up in the refrigerator. After a couple of days I had the idea of dividing the custard in half and adding chocolate chips. 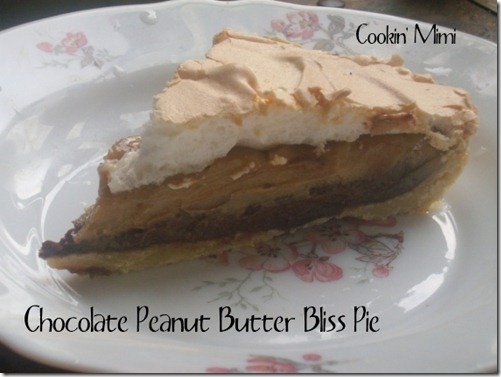 A peanut butter and chocolate cream pie. Preheat oven to 350 degrees. Whisk together flour, sugar and salt in a heavy bottomed sauce pan. Add the milk, egg yolks and butter. Cook over medium heat whisking constantly until the mixture has come to a bubble and has thickened enough to coat the back of a spoon. Remove from the heat and stir in the vanilla. Place chocolate chips in a large heat proof bowl. Working quickly, add half of the thickened custard and stir to combine. Whisk the peanut butter into the other half of the custard. Layer the mixtures in your pre baked pie shell, chocolate layer first. Set aside while you make the meringue. To make the meringue place egg whites in a glass or metal bowl. I use a stand mixer but you can use a hand mixer. Beat egg whites with a pinch of cream of tartar until they are frothy. Slowly add in sugar and beat until stiff glossy peaks form, stir in vanilla. Add to top of pie, making sure to seal edges well. Bake in preheated oven for 10-15 minutes or until golden in color. Place in the fridge and let it chill completely before serving. Looks so delicious! I’ve had such a craving for peanut butter lately. This would have hit the spot!